your energy moves and begins to spin. This Special Offer is a monthly membership which allows access to the Tai Chi Chuan 64 Forms content, videos and images which is always available. You will also receive access to new videos and articles as they are produced. Activate Your Chi...Get Started Today. Tai Chi Chuan is a practise of of movement and meditation that utilises the Taoist philosophy of balance and harmony, Yin and Yang. The 64 Forms are an 'Expression of Chi' and a comprehensive form of exercise that promotes Health, Energy and Fitness. Tai Ch Chuan 64 Forms build and develop your Chi Energy right from your very Core. Providing vibrant energy to nourish your body and your life. Discover how Tai Chi Chuan rewires and develops your muscle memory, co-ordination and relaxation response. Every part of the body is connected through the gentle flowing movements of the form. Learn how each movement has a martial and energetic application. Providing tools to transform, develop and neutralise stress on all levels. Follow along with both front and back views of the videos. Developing each section one step at a time. "This form is a wonderful progression from the 24 forms. I can really feel the my Chi Energy Spinning!" "The 64 Forms have expanded my knowledge of Tai Chi and deepened my awareness of Self!" "I Feel Ready for Anything after my Daily Practise of the 64 Forms!" As a new member you will receive a new section of the form each week. The Form is progressive and is built slowly overtime. 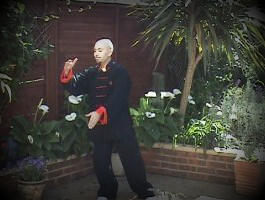 The programme includes footage of both front and back views of the Tai Chi 64 Forms. These include "The Tai Chi Warm Ups", "Martial Applications" & "All 8 Sections of the 64 Forms". Each will be covered individually so you can enjoy and develop at an easy pace. The theory of Yin & Yang and the 13 Energy Patterns of Tai Chi Chuan play a key part of 64 Forms. With practise the art of staying present, centred and relaxed will flow into every day life. Membership can be upgraded or cancelled at any time.